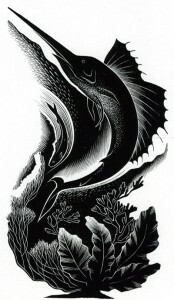 Paul Landacre is my wood engraving hero. Even more so now that I’ve come across this article he wrote on the subject in the early 1940’s for a book called The Relief Print Woodcut Wood Engraving & Linoleum Cut. For those interested in this subject I hope you will be inspired by his insights! THE OUTSTANDING VIRTUE of a wood engraving perhaps is its strength. The contrast of its strong blacks and whites combined with delicacy of line gives it an infinite range of color and texture. 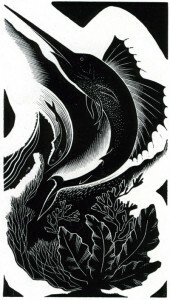 To achieve the particular quality of beauty inherent in the medium of wood engraving one must learn to think in terms of white on black an obvious statement, certainly, but this does not mean a simple, literal reverse of a design conceived in black on white. (Black on white is, of course, the method we naturally use most for purposes of representation from the time we are able to hold a black pencil against white paper.) Until thinking in terms of white on black becomes natural or instinctive like learning to think in another language, the best solution is to make a free translation. That is if wood engraving is to be used in a creative way and not as a copying process into which it degenerated in the latter part of the Nineteenth Century when the engraver was merely a highly developed craftsman. 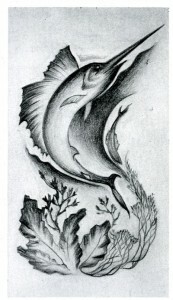 There is much excitement in translating a rough pencil, crayon or charcoal sketch into a white line engraving. Even a dull sketch may become fascinating by virtue of the change into crisp white lines against the black and challenging nature of the medium. All sins are forgiven as you enter a new field with your design and even the fact that the lines are created by pushing the tool from you instead of pulling toward you, as in other forms of graphic expression, adds zest to the process. To engrave from a sketch done with white ink or white crayon on black board or paper is disappointing and spoils most of the fun. Besides it’s not sporting. Give the graver and the wood a fair chance. It is disappointing because there is a tendency to follow too literally a design conceived and created in another medium, a medium which has none of the beautiful flowing, lilting qualities of the engraved line on boxwood: the clear-cut, modulated white lines that only a graver can make. The clean feel of a sharp engraving tool slicing through the end-grain wood is inspiring in itself. Again, while it is true that slavishly following a pencil sketch in white, line for line, will result in a design, it will be a shallow thing, a sort of negative and will possess little of the true character or possibilities of a wood engraving. The most satisfactory results are obtained by the use of end-grain boxwood. A good piece of boxwood is very hard, fine-grained and has a uniform light yellow color. Being end grain the vertical pores of the wood support the finest lines, and have great resilience under pressure in printing. Such a block is much superior even to metal in wearing quality. The end grain of almost any hard, fine-textured wood may be used, such as maple or orange, but no other is so fine as box. The box tree is small, and type-high blocks are made up of many small pieces fitted together and finely polished-probably the finest printing surface of any material used in relief printing. The slightest scratch will print if one is a good printer, so it is best to resist caressing the tempting surface of the block while wearing a ring. If the wood is improperly seasoned it is apt to split and if too old and dry the lines may crumble or chip while engraving. Unfortunately the only sure way to test a piece of wood is to engrave on it. Any dark reddish rings in the wood are to be avoided if possible, as they are harder than the surrounding yellow wood and make the graver rise almost imperceptibly as the lines cross them. The result may appear in the finished print as a kind of shadow, giving a rainbow effect. Any oil coming in contact with the surface is quickly absorbed by the wood and will repel the printing ink, causing a light spot in the print. Excess moisture or sudden changes in temperature may warp the block, causing it to split under pressure of printing. Keeping the block on edge when not in use and coating the back with shellac lessens the danger of warping. If it has warped, sometimes it will straighten out again, sometimes not, depending on its age and upon weather conditions. 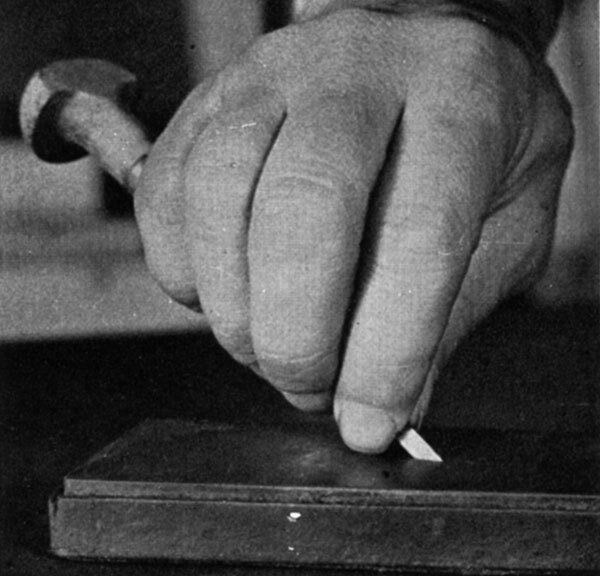 The block, as it comes, has not only a line printing surface but also a fine sketching surface for the pencil.As the engraving progresses the pencil lines are removed by the tool, and as there is very little contrast in color between the surface and inner wood it becomes increasingly difficult to judge the design as a whole until a proof is pulled. A happier solution in many respects is to coat the surface of the block with India ink or printing ink. Printing ink makes a thinner coat which permits careful judgment of the width of line. Its dull surface reflects little light and is consequently easy on the eyes. It cannot injure the printing surface and may be removed with gasoline when the block is finished. To apply the ink, roll it on thoroughly with the engravers’ proof roller as in printing. Pull one or two proofs on newsprint to remove excess ink, or until the yellow of the wood shows faintly through, and let it stand for a day or so until the ink dries slightly. This beautiful black but slightly greasy surface is poorly adapted to sketching, but the most satisfying thing about this method is that the engraved lines appear light and clear against the dull black surface of the block and the progress of the engraving may be seen at all times. In order to get the design transferred to the block, simply trace the principal areas of the sketch on tracing paper, rub the back of the tracing paper with a soft pencil, place it firmly over the block and trace again with a medium hard pencil. The print will be in reverse of the sketch, naturally. If it is desired to have the finished print oriented like the sketch it will be necessary to trace the guide lines in reverse on the block before engraving.The lines thus applied are not very fine but serve as an excellent guide, having a light, silvery appearance almost white, whereas the pencil lines applied directly on the ink-coated block are dark and shiny and almost impossible to see except at certain angles. Very little detail can thus be transferred but there is the advantage of having perfect freedom either to follow or disregard the guide lines on the block or the original sketch also in knowing how the lines are going to print as the engraving progresses. The best procedure after placing the design on the block is to engrave lightly the principal lines and rout out the largest whites to give a good view of the basic design. It is possible to make a very presentable engraving with only one tool and a block of wood. There are hundreds of tools or gravers made, though they are mostly variations of the four shapes shown in the sketch on page 30. Tools may be purchased from a wholesale jewelers’ supply house, as they are the same as the ones used in engraving metal. Very few are needed and, being made of fine-tempered steel, will last a lifetime. Ninety per cent of my own work is done with two variations of the gravers shown in sketch number 1, and the chisel-shaped one numbered 2, which is used for routing. The first known as a lining tool, may be had in varying degrees, the back becoming narrower successively until it becomes almost a knife edge. The exact one to use is more a matter of personal taste than anything else, and my advice would be to purchase one graver and learn to use it; put it through its paces. It will be found to be quite versatile and capable of making thin, delicate lines; swelling, modulated lines; bold, broad lines and short, dart-shaped lines, as well as dots. Get another tool when a definite need arises and let that need dictate the choice. Now this is where textbooks – and perhaps more orthodox engravers – and I come to a parting of the ways. Do not waste too much time practicing with lines and curves and textures in the abstract. Start out with a definite design in mind and plow through it to the best of your ability, and it may be more like plowing than engraving, the first time; but it is my belief that more about engraving may be learned in one hour of real trying than one hundred hours of preliminary doodling. Don’t be afraid to draw with the graver. Of course there is no harm in having an extra block handy to experiment on but do it with a definite aim in view. Technique is certainly of no use unless used for a purpose; and a good design, even if crudely done, has more stimulation, gives more incentive to an engraver and teaches more about the use of the tools than anything else. This viewpoint is emphasized in an attempt to refute the old wood engraving tradition that required an apprentice to spend six months or a year learning the use of tools and practicing technique before attempting a design; that tradition still casts an aura of futility about the medium. The sharpening of the graver has more influence on the quality of the line than one would imagine. There is quite a difference in a pretty sharp tool and a very sharp one. Also the angle of the face of the graver is important: if an angle is too acute it weakens the point which may break off; if too obtuse it will not cut clean and is apt to chip out pieces of the wood, particularly in cross-hatching. Some experimenting may be necessary to grind certain tools to the right angle, which may or may not have been correct when purchased. To sharpen, hold the graver firmly between the thumb and forefinger, with the flat end held against an oil stone of medium grade, using a circular motion. This takes some practice, as keeping the flat end parallel with the stone is determined by a sense of touch and sound, it being too small to gauge accurately by sight. It scratches when it isn’t flat. Then use the finest and hardest stone obtainable in the same way, finally finishing with an Arkansas stone to remove what burr there is and polish it. Once it is properly sharpened it takes very little work to keep it in shape. But keep it really sharp! Another adjunct to engraving is the engraver’s pad. While not indispensable it facilitates the turning of the block and enables one to make evenly curved lines by holding the tool firmly at the proper engraving angle and turning the block against the graver. The pad also enables one to tilt the block at the best angle to the light. This pad is simply two circles of leather sewed together and filled with sand or fine shot until it assumes a rather flat, elliptical shape. The size, of course, is determined somewhat by the size of blocks to be engraved – six to ten inches in diameter should serve in most cases. In order to determine correctly the spacing and depth of the lines, and prevent eye strain, it is best to have some sort of diffused light. A good arrangement is to place a 150 watt light behind a frame covered with fine silk or tracing paper which is hung at an angle and about two feet above and directly in front of the work. 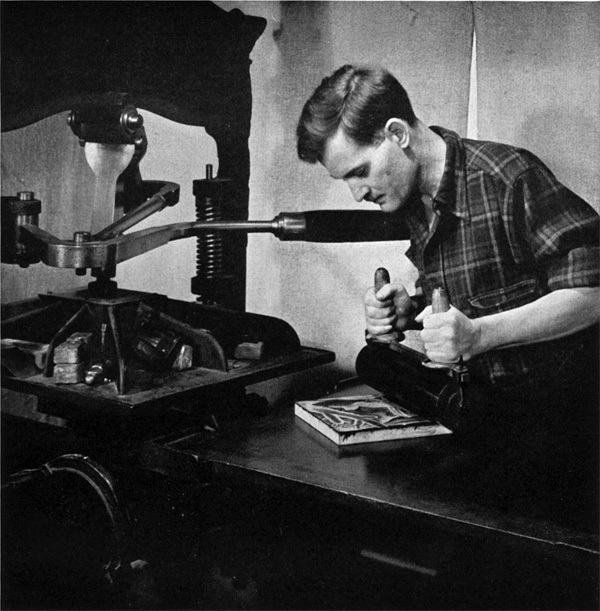 Practically every article on wood engraving technique describes the orthodox method of holding the graver. In my opinion this is more of a limitation than an asset, though it gives perfect control of the tool in a limited area and was adequate in the days of literally copying drawings or sketches, and when the engraver was only intent on the immediate passage of finely engraved or textured detail-the design as a whole having been worked out completely in another medium. It presupposes the engraving to be simply a process of texturing and lining without much possibility of exploring while in the act of engraving. There is just one point and that will have to be learned by experience: the graver must be held at the proper angle to the block-an angle which differs somewhat with individual tools and the type of line being made. If held too low it will slip; and if too high, it will dig in. The gravers have round handles which are flat on the bottom on account of the low cutting angle. Any grip that enables one to push it through the wood and lift the point at the end of a stroke will serve. This is heresy, but it may be gripped in the fist, if the handle is not over the block, using the thumb of the other hand as a guide. Keep correct form in the design rather than in the method of engraving. If very delicate lines are to be made in an area not adjacent to a supporting black area or darker portion, they may be lowered below the printing surface slightly, by first scraping with a knife or drypoint scraper, thus lessening the pressure on that portion in printing. The scraper may also be used on the edges of routed areas if it is desired to have the lines fade gradually into the white area. The amount and angle of scraping depend on the pressure used in printing, type of paper, kind of roller, size of area, etc., and will have to be learned by experimenting for individual printing conditions. The scraping should be done before and not after the lines are made, of course, and the scraped area re-inked or blackened. This lessening of pressure on edges or spots may be achieved in some degree by using make-ready in printing, but it is simpler and surer to do it on the block. It also obviates the necessity of locking the block up in a chase unless exact spacing on the sheet is desired or if it is to be used with type. In any form of graphic art a clear idea executed surely without fumbling is a goal to achieve, but most mediums have some means of erasure. Wood engraving is perhaps the most difficult of the graphic mediums in regard to making a change once a line is engraved, unless special woodworking equipment is available. The procedure requires boring a small hole in the area to be reworked, then driving in a tapered plug to a tight fit, cutting it off and polishing it even with the printing surface without damaging the surrounding area. And “even” means even to a thousandth of an inch or so, otherwise the plug will print. If a line an inch long is to be removed it means that a series of live or six interlocking plugs must be put in. Of course a corner or section could be sawed out and another piece fitted and doweled in, though it would require much time and talent in a medium other than engraving. Having only once tried the procedure of plugging and re-engraving, my advice would be to spend more thought before using the graver. There is one alternative, however, and that is to work the mistake into the design in such a way that it becomes an asset instead of a fault. Of course this may require some nice readjustment of values throughout the design; it puts the engraver on the spot, so to speak. Even so, one keeps on engraving instead of boring holes and may even be stimulated into doing something better than was at first intended. Theoretically, anything done to a block which lowers the printing surface will print, but to engrave properly one must always keep in mind the press conditions under which the block will be printed, as many things possible to engrave are difficult to print except under certain conditions. If the engraver does his own printing, as happens in my case (excepting illustrations), he may learn gradually that certain effects are dependent on his ability as a printer on a certain press, and may or may not be feasible on another-here, again, no amount of theory or explanation will take the place of experimentation. If the engraving is to be used as an illustration and turned over to another pressman, one should engrave accordingly;generally the design should be lighter in tone, particularly if it is to be printed with type. Thin, isolated lines in black areas are difficult to print clean, as the ink for most power presses is much thinner than the stiff ink possible to use on a hand press. However, a great deal depends on the pressman. Much of this is still a mystery to me, unfortunately. One of the tedious parts of engraving is the routing. Hours must be spent removing wood carefully with the small chisel which has to be used on hard end grain, and the result is just something that won’t print. A shallow, narrow ditch should be chiseled out, pushing toward the line bordering the area to be removed. After deepening the line, enlarge the ditch until in chiseling the remaining wood toward the center of the area the back of the chisel does not bear on the engraved edge. The depth in the center depends on the size and shape of the area, the sag of roller and paper being a constant factor up to the limit of about three-sixteenths of an inch. A power router saves much time, of course, if one has definitely decided to remove a given area, but it isn’t a cure-all by any means and cannot take the place of much of the laborious hand work. The ink for hand printing should be a stiff, heavy bodied variety such as lithographers’ ink, preferably with little or no dryer in it, the ink drying by absorption. My own ink is Woodcut Black purchased from the International Printing Ink Company. The non-drying quality is something of a personal preference. It allows the ink to be removed from the block with ease, even after standing for weeks while engraving; and of course the ink does not harden on the roller or the ink slab. This is an advantage while pulling trial proofs or printing a few prints on successive clays obviating the necessity of continually washing up. The function of the drying ingredient in inks is principally to prevent offsetting in fast printing. The stiff or heavy-bodied quality, however, is necessary in printing large areas of black in conjunction with line, delicate lines. The amount of thin ink adequate to print the delicate areas usually is not sufficient to cover the big flat areas, and if enough thin ink is added to cover the solids the delicate lines may fill up. So the stiffer the ink the better, though it takes hand-rolling and much pressure to use it. Many varieties of paper may be used but a soft wove sheet with little sizing is best. Since wood engravings are printed by the relief method the wire marks in a laid sheet may show in the prints, though much depends on the individual print. A white paper gives more brilliance but an ivory or cream-toned paper may be desired for warmth or softness. A soft-textured or thin paper may sometimes be printed dry, but with an all-rag, handmade stock the best results are obtained by printing wet; that is, the sheets are slightly moistened by sponging or pressing between moist blotters before printing. The right degree of dampness for different papers is another thing that has to be determined by experiment. In inking the block it is best to use an engraver’s proof roller with a firm consistency, and large enough to roll across the block without lapping the block mark on the roller. A sheet of plate glass makes a good ink slab. The ink should be thoroughly rolled out each time the roller is pressed across the block, and of course after each impression. Four to six rollings across the block for each impression will give a thin but even coating of ink. 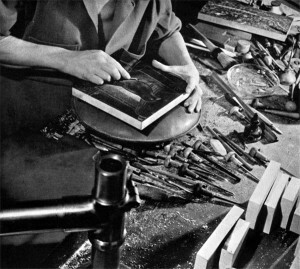 After laying the printing sheet on the inked block, an impression may be taken by the rather primitive method of rubbing the back of the sheet with a bookbinder’s bone folder which has been ground on the end to a chisel shape. Or an old letter-copying press may be used if type-high bearers are placed around the block – to insure even pressure – with several sheets of newsprint placed over the printing sheet to act as a printing blanket. I print my engravings on an old Washington Hand Press, using a silk timpan and a printing blanket made especially for hand presses. This method is, for certain types of engraving, undoubtedly superior even to modern power presses which have more advantage in speed. The advantage of the hand press lies in the great pressure which may be sustained and the amount of pressure being felt in the pull of the lever. Of course much of the procedure in printing wood engravings is the same as the method of printing type, about which many books have been written. After pulling trial proofs the block does not need to be cleaned with gasoline (this, of course, will color the white portions and obscure the contrast of dark and light) but the excess ink should be printed off on newsprint to prevent a false impression of the lines in subsequent proofs. Not until the engraving is completed should it be cleaned thoroughly down to the wood. Since the block is absorbent the quantity of ink deposited in the finer lines during each cleaning may eventually prevent their printing sharp, unless some of the excess gasoline and ink is absorbed by printing the block with several sheets of newsprint immediately after each cleaning – while the ink is still in solution. The block should then stand on edge until the gasoline has evaporated – before the printing of the edition begins. It has been my intention in writing this article to give, from my own experience, an incentive and guide to potential engravers rather than try to offer a formula. There is, as suggested, plenty of room for experiment and improvement in the art of wood engraving. 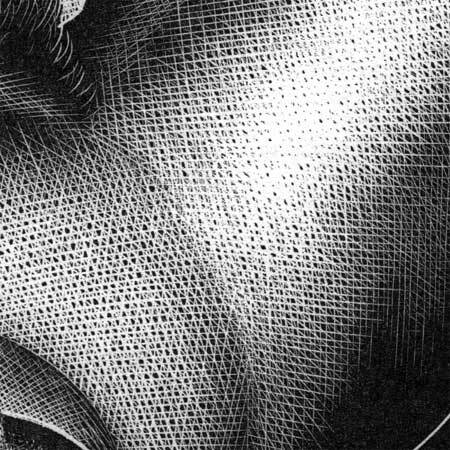 The possibilities of wood engraving when it has been used as a sensitive medium of expression and not simply a function in the duplication of design-have never been exhausted by anyone. 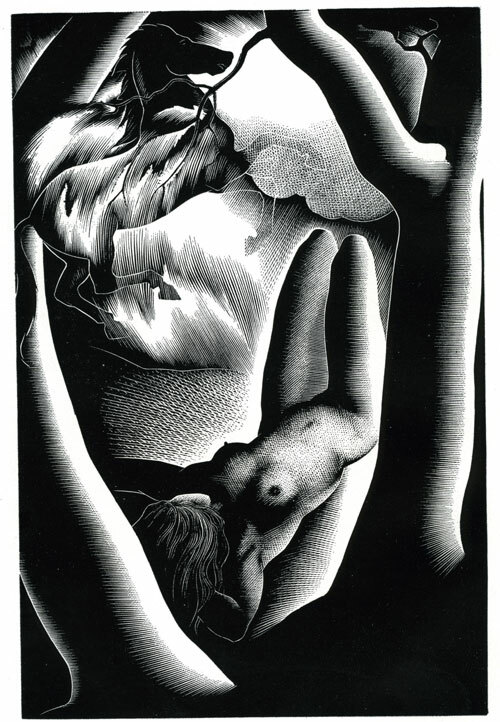 My own study of wood engraving, which started about seventeen years ago, was conducted almost entirely by trial and error as my only formal art education consisted of some intermittent classes in life drawing. At that time much less wood engraving was being done and there was no one in this vicinity to advise me. It was also difficult to find any books on the subject, which necessitated my digging it out for myself. I have engraved about one hundred and fifty blocks for my own signed editions, also about three hundred others for illustrations, bookplates, commercial designs and so on. Thank you, this is very helpful and mirrors many techniques and advise given to me by Stanley Palmer. He is NZ’s most established printmaker and I am about to work doing woodcuts in his studio. Is this illustration above your own work? It’s beautiful. Hi Michelle, I’m very happy that you’ve found this info useful. It makes it worthwhile to do the work of finding and posting it. Right now I’m posting chapters from Ian Macnab’s book on wood engraving. I have quite a library to put online. Best of luck with your work and no, that isn’t my work, it is a Paul Landacre engraving. Thank you very much for the info John. Wonderful artist Paul Landacre I discovered recently. or advise me what tools are necessary to start?